Jessica Vierra, alternate media student assistant, explained the process of turning physical books into online-accessible, auditory books. 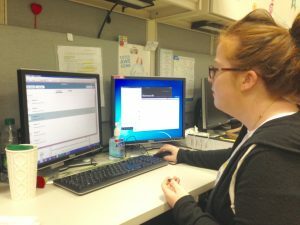 The Office of Services to Students with Disabilities (SSD) is fully automating their services so students may access them 24 hours a day, seven days a week. The services offered to students include: on-campus mobility, sign language interpreters, real-time captioning/remote captioning, note taking services, smartpen program, exam accommodations, alternate media, and priority registration. 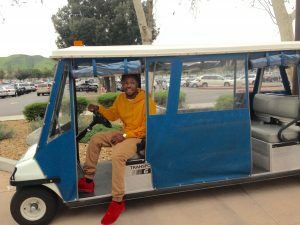 Other CSUSB members can contribute to the disabled community by checking and reporting accessibility issues. This includes not sitting in the accessible furniture, referring students to the office, and volunteering at the Ability Awareness Fair. The Ability Awareness Fair is a “hands-on opportunity which exposes the general student body not only to the challenges faced by individuals living with disabilities, but also as a chance to showcase technology and other assistive aids that help them to overcome adversity and build awareness for [those] students,” said Director, Marci Daniels. For the first time, throughout its almost 40 years existence, the SSD office has began process of creating a students with disabilities chapter of an international honors society, Delta Alpha Phi. “Our students with a verifiable disability that meet the GPA requirements will get honors at graduation and will get a special cord and pin,” continued Daniels. Beyond what has been previously mentioned, the SSD office goes one step further to enhance their members’ lives. The Workability IV office is a “group of very dedicated individuals whose mission is to help our students with disabilities find internships and employment in their fields of study,” said Daniels. The Center for Disease Control (CDC) estimates that one in five Americans have a disability, estimating that 11 percent of our campus falls under this category. There are over 800 students with verified disabilities served by the SSD office. Jordan Jerry, student assistant, talked about the transportation accommodations students with disabilities have. According to Marci Daniels, there is presumed to be over 2,000 students who should be receiving disability services. Not all students disclose they have a disability “because I think they’re afraid of the stigma attached,” said Daniels. “Everybody just wants to belong so I think it’s important for all of us to recognize the diversity of our campus and be inclusive of all our students,” Daniels continued. A disability can include (but is not limited to): visual impairment, hearing impairment, physical impairment, learning disabilities and even temporary disablement. If a student is seeking services from SSD they must submit an application and documentation that verifies their disability. Once the application is submitted an interview is set up with a SSD staff member. Upon verification of medical documentation and class enrollment the student will speak with an SSD counselor to review the services being assigned. Other CSUSB members can contribute to the academic success of disabled students by becoming note takers. To become a note taker, students must submit a class schedule to the SSD office or volunteer when an office member asks a specific class for a participant. Once a student becomes a note taker it is their responsibility to attend the assigned class regularly and take legible notes that can either be sent to the office electronically or in person. “Often times, [students with disabilities] are overlooked and face challenges trying to integrate with the general student body,” said Daniels. According to Daniels, it is the job of the community to create a welcoming and empowering environment for all members, not just on campus but also in the workplace, and in general everyday life.